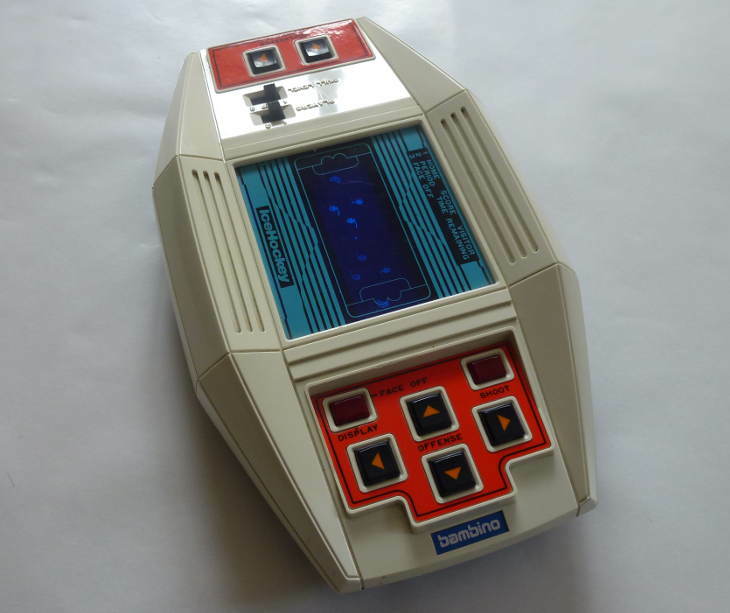 Back in the early 80s any gathering of school boys inevitably involved the comparison of each others handheld electronic games. The games to have were Firefox F7, Astro Wars or maybe something in the Tomytronic 3D range. The boys who owned these games earned respect and attracted a crowd of eager gamers waiting for a go. Other boys who were perhaps too vague when preparing their Christmas list or had more budget minded parents were less fortunate. They paid the price by having to front up to these childhood events with some bizarrely shaped handheld game from the far east that nobody had heard of. Respect for owners of these obscure electronic games was thin on the ground and any vaguely interested party would have a quick game before handing it back to to it’s owner with a look of pity. But, every now and again, one of these mysterious games would turn out to be a gem and capture the imagination of the gathered gamers, Bambino’s Lucky Puck Ice Hockey was such a game. 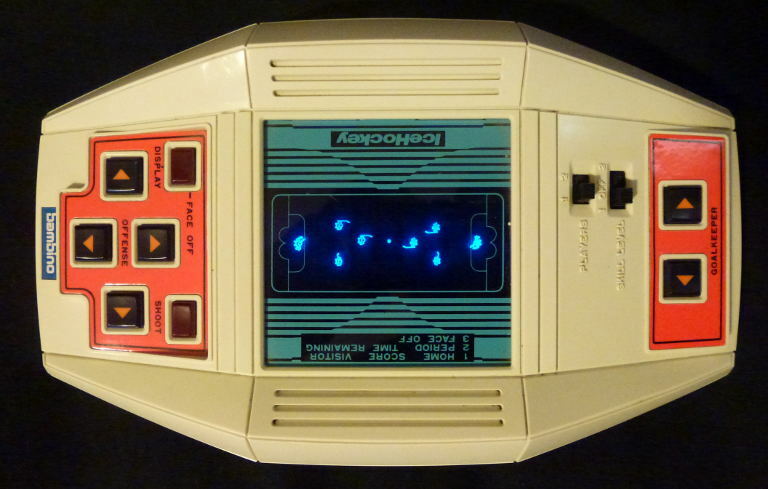 It came in a sturdy white plastic housing that was less pleasing on the eye than many of the electronic games of the day. It featured a vacuum fluorescent display (VFD) that with it’s ice blue glow fitted well to the task of depicting an ice hockey rink. You controlled the sole attacking player and your aim was to skilfully weave through the packed opposition defence and score as many goals as you could in the allotted time. The AI was basic with the defenders moving about the limited grid of spaces whilst gravitating towards your general location. If you collided with one of these defenders then your attack was over and you had to start again. It had a two player mode. The unit had two sets of controls one at either end of the awkwardly shaped 70s case and if you switched to two player mode the second player took control of the defending keeper. 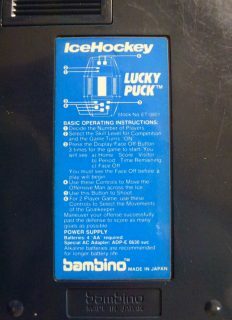 This allowed you to go one on one with your mate in an epic puck slamming face off. OK, it’s no FIFA or Pro Evo but it was the 80s equivalent and the all important element of competition was there. Stick that in your pipe and smoke it (which you could do indoors in the 80s) Astro Wars. Controls for attack and goal keeping were situated at either end of the case. 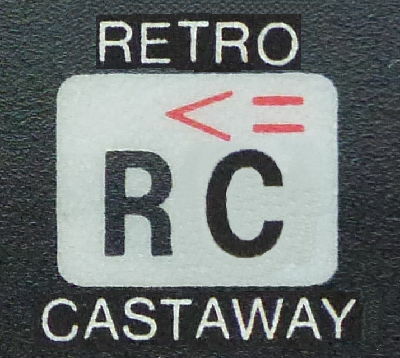 Instructions could be found on the back of the casing. Click the image to enlarge. We’ve got a unit that’s in pretty good nick here and still has the all important battery compartment cover that all too often parts company with the main body never to be seen again. The game itself is actually pretty good and their is retro gaming joy to be had carving your way through the opposition defence and tucking the puck away. There are three levels of difficulty that basically just cause the opposition to move faster making the game much harder to play. As you can see we’re taking this pretty seriously, defeat is not an option. More pictures including the box, display case and the instruction manual can be found here on the Handheld Museum website. You can pick these units up at a very reasonable price on eBay, just make sure the battery compartment cover is present. If you do get one drop us a line and let us know your high score.